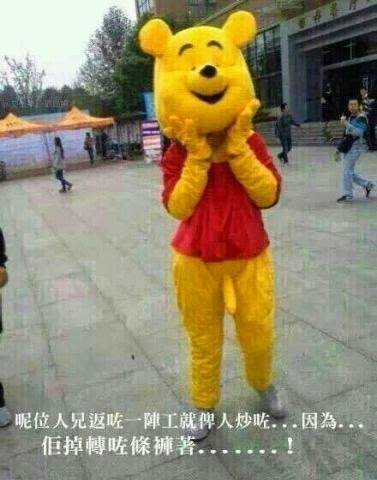 This young woman did not really think through the way the Winnie the Pooh costume was supposed to look. She likely meant well, but....Well, see for yourself. Need to be more careful about putting the pants on. 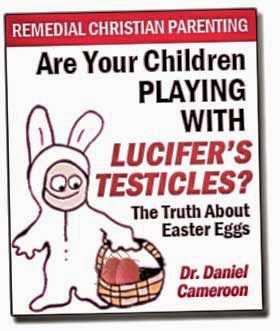 If you put them on backwards, you'll scare the children, and amuse me. And William H, who was amused enough to send it in. 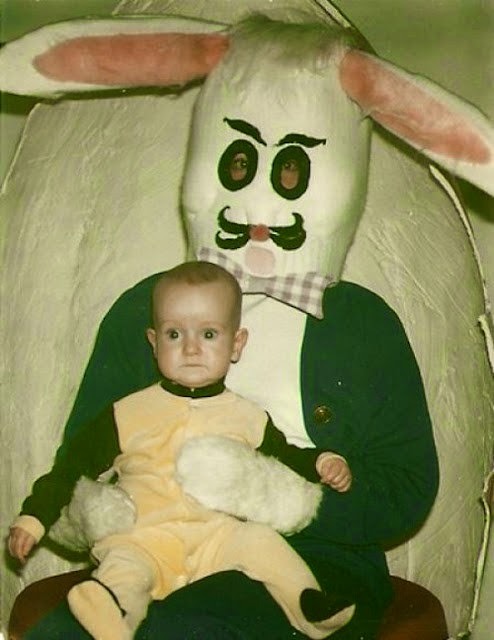 Not sure which entity in the photo is the scariest! "The wiliest tools of the Devil"
My new piece in The Freeman. Angus is an experience welder. He could probably stitch you up one of these, if you have a hankerin' for one. 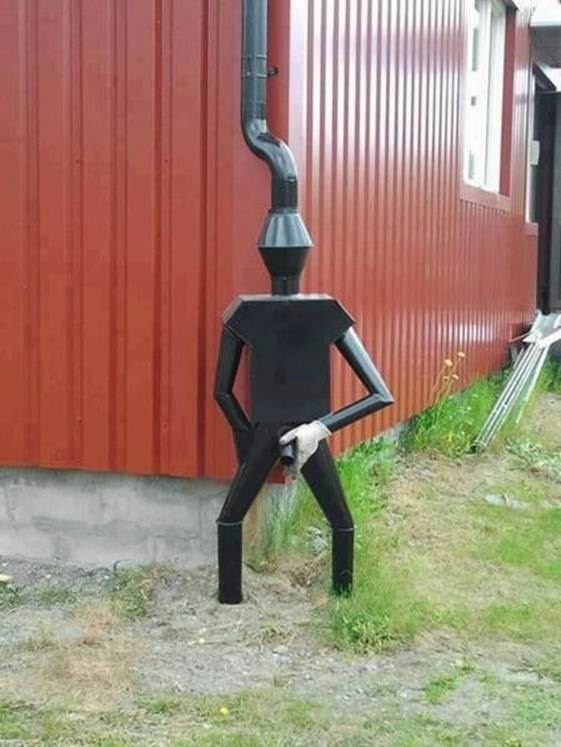 It's going to handle your downspout. Abstract: Although group membership has many privileges, members are expected to reciprocate those privileges. We tested whether in-group members would be punished more harshly than out-group members for marginal fairness norm violations within ultimatum game bargaining interactions. Participants considered monetary splits (of US$20) from in-group and out-group proposers, which ranged in proportion. Accepting an offer yielded the proposed payout; rejecting it caused each player to earn nothing - a punishment of the proposer at a personal cost. Participants exacted stricter costly punishment on racial in-group than out-group members for marginally unfair offers (Study 1), an effect that was replicated with college group membership and magnified among strong in-group identifiers (Study 2). Importantly, ultimatum game decisions were driven by fairness perceptions rather than proposer evaluations (Study 3), suggesting our effects reflected norm enforcement and not esteem preservation. These findings illuminate a previously unexplored process for maintaining group-based norms that may promote in-group favoritism. How mighty is Dan Benjamin? Very, very mighty. So, this screed was published in the Chapel Hill News. The Raleigh News and Observer was so taken by its forceful logic and persuasive evidence that it was reprinted there. Roses is owned by Art Pope, a man whose politics I vehemently oppose....Roses is the only store of its kind within walking distance of the neighborhoods that surround University Mall. Many of these are among the poorest in Chapel Hill...Art Pope was essentially using his customers’ money against them. And because of their limited mobility and the lack of other nearby options, there wasn’t much they could do about it. While the demise of such predatory practices are to be cheered in the long run, it’s tough to sell that point to folks who’ll find themselves without a place to buy clothes and other household necessities once Roses closes. ...Were they being exploited? Absolutely. But that doesn’t get make things any easier for them in the short run now that Roses is leaving. Of course, I believe that systems of commerce need to be established that prohibit the creation of an underclass that at once produces and consumes low-cost goods for the benefit of the upperclass. So, to be clear, people are being exploited by having a store that is conveniently located, has good quality, and low prices. He wants new "systems of commerce," because this whole convenient/good/ cheap model is exploitative. It's the system of commerce, itself, that creates an underclass. Now, I shouldn't be so hard on him, perhaps, because he's a journalism major, and so has never taken any actual college classes. I felt conflicted reading Henry Gargan's POV piece ("As Roses closes…", April 13). Some folks are so ignorant of markets that they think selling quality products at low prices in convenient stores such as Rose's is "exploitative." Having Mr. Gargan argue this point, and having the N&O give it prominent space, makes for a useful reading for my economics classes. That made me happy. Still, it's upsetting to see Mr. Gargan exploiting his privileged position. UNC is protected from any kind of competition, and takes its budget from public taxes. Mr. Gargan pays, at most, a fraction of the cost of mislearning economics; he is essentially using taxpayers' money against them. And because the state uses taxes to subsidize leftist think tanks like the Journalism School, there isn't much those of us who care about education can do about it. The big picture is that Mr. Gargan will never have to face any of the costs of his exploitative misuse of tax funds for personal gain. But the little picture, the one solace in all this, is that I can now use this bizarrely misinformed view of commerce as a teaching tool. One clarification: I was trying to parody both the argument and the steps in the argument in Mr. Gargan's original piece. I do not, in fact, think that the UNC Journalism School should be prevented from teaching whatever ideologically biased material appeals to them, any more than I think Mr. Pope should be prevented from exercising his rights to use his support for causes he believes in. So the "subsidize left-wing think tanks" is a parody; I don't think the Journalism School is a left-wing think tank. It's just a bunch of folks doing the best they can, given their beliefs, with the very limited intellectual resources at their disposal. 3. Prof. pranks: April Fools. Click for an even more federally-owned image. Now, there is a genuine kerfuffle about land rights. Not ownership, exactly, but the right to use the land for cattle grazing. Adverse possession, Lockean combining my labor (or cattle) with the land, and so on. There's this. And then this. These people are crazy, right? Why don't they graze their cattle on private land, and stop whining? Check out Nevada, folks. In the map above. There is no private land. Have we reached a cow tipping point? What is going to happen? My answer: sell it, sell most of it. My friend Holly Fretwell at PERC wrote about this back in 2003. Fifteen years ago, Terry, Vernon, and Emily worked on this. 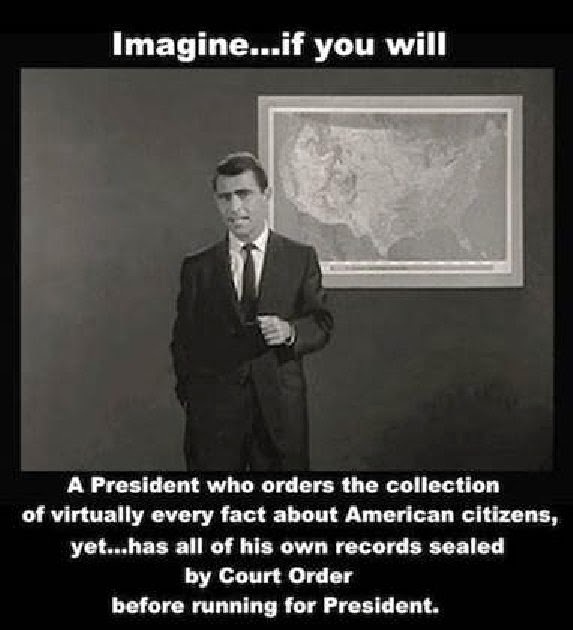 It's not like we didn't know. Sell it. SELL IT! More recently, Holly is still trying to get someone to listen.